Offering you a complete choice of products which include varicose veins stockings, varicose vein compression stocking, compression stockings, pantyhose stocking, varicose vein stocking and varicose vein stockings. With the help of skillful and devoted professionals, we are engaged in offering a best quality range of Varicose Vein Compression Stocking to the customers. This stocking is preferred to prevent venous diseases by keeping the elasticity of veins. Moreover, the whole range of products is checked on well define industry parameters prior to its dispatch. 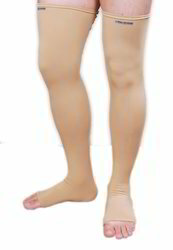 Hiakan's varicose vein compression stocking, is class ii, stocking, imported from taiwan. it is thigh lingth,tubular compression stocking, with gel ball on the top for anti slippery action. drs recommend it for varicose vein and many other problems. good discount available for the patients. we welcome trade inquiries also from all over india. With the help of skillful and devoted professionals, we are engaged in offering a best quality range of Compression Stocking to the customers. This stocking is preferred to prevent venous diseases by keeping the elasticity of veins. Moreover, the whole range of products is checked on well define industry parameters prior to its dispatch. Customized stockings also made by taking patients size. With the help of skillful and devoted professionals, we are engaged in offering a best quality range of Pantyhose Stocking to the customers. This stocking is preferred to prevent venous diseases by keeping the elasticity of veins. Moreover, the whole range of products is checked on well define industry parameters prior to its dispatch. We have gained the specialization in offering a wide array of Varicose Vein Stocking in the market. It gives great relief to tired, aching, heavy, tingling and burning, numb legs, ankles & feet. Presented products are available with us in different stipulations to meet the diverse demands of the customers. Moreover, this product is available at most economical rates. We are consistently delivering a quality assured spectrum of Varicose Vein Stocking to our prestigious customers. 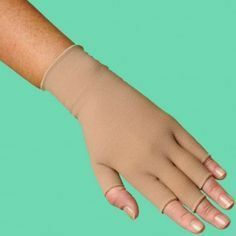 The offered stocking is designed to compress and support injured part. Provided stockings are designed by our professionals using the best and soft fabric that help to wearing it comfortable. We are the Manufacturer, supplier & Exporter of Varicose Vein Stocking. Varicose Vein Stocking that offer effective support and relief to tired. The company's principal activity is manufacturing of Pharmaceutical products for multiple therapeutic fields. Company operates in total compliance with the GMP norms laid down the W.H.O., Customer satisfaction has always drawn CPL strategies and attitudes. We are the Manufacturer, supplier & Exporter of Varicose Vein Stockings. Varicose Vein Stockings socks that offer effective support and relief to tired, heavy and aching legs. With the help of skillful and devoted professionals, we are engaged in offering a best quality range of Compression Stockings to the customers. This stocking is preferred to prevent venous diseases by keeping the elasticity of veins. Moreover, the whole range of products is checked on well define industry parameters prior to its dispatch. Above knee or thigh length compression stockings for varicose vein and lymphodeama. 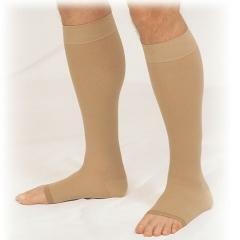 Below knee compression stockings for varicose vein and lymphodeama. Stylish and trendy Compression Gloves for men & Women. Hiakan International provides you superior moisture management. The Goat Leather reinforcement in specific areas, Mesh inserts between fingers for ventilation with Silicone adjustable strap with hook and loop closure and ergonomical wrist make it extremely useful for your needs.